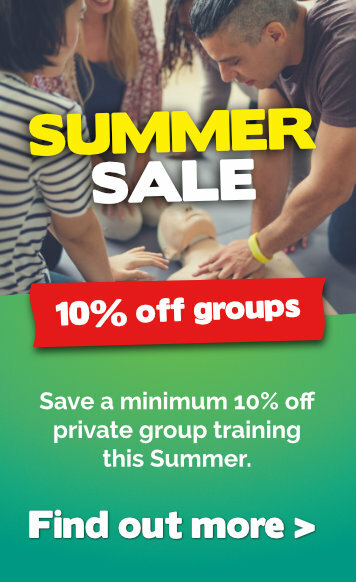 Asthma first aid video & free poster download! It’s estimated that 90% asthma sufferers are using their reliever puffer inhaler incorrectly. Yes 90%! This impacts on the effectiveness of their medication and could be the difference between recovering from mild asthma symptoms and a full blown attack requiring emergency medical treatment. When you consider there are 400 fatal asthma attacks in Australia every year, it’s very worthwhile being confident in the right technique to help someone take their asthma reliever puffer most effectively. When attending to someone suffering from asthma, acting calmly and giving simple reassurance can make all the difference. 1. Sit the person comfortably upright. If symptoms are severe call an ambulance immediately. 2. Assist them with their blue reliever medication according to their asthma action plan. If no plan is in place, use this 4 x 4 method. Check that the medication is still in date. If it has expired use a back-up or ask to borrow someone else’s. Shake the puffer device and insert it into a spacer if available. Give four separate puffs allowing them to take four full breaths from the spacer after each puff. If there is little or no improvement give four more puffs. 4. If there is still no improvement, call an ambulance immediately. Breathing emergencies like asthma can be very scary for anyone so continue to reassure them while giving 4 puffs every 4 minutes until the ambulance arrives. 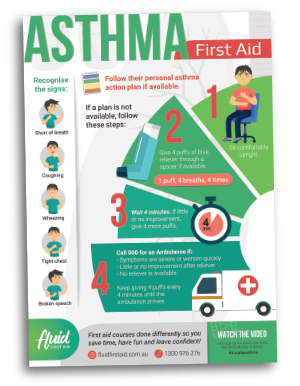 Download your free Asthma first aid poster!